A spread from the book "Knitted Babes"
Have you always made dolls? Ironically, I started actually making dolls for something to do when my son was a toddler, about 14 years ago, and I was expecting my second child! - I know it sounds like I should have had my hands tied with a two year old (hence the exclamation) but he was always content to sit and watch or play with whatever I was doing at the time be it gardening, baking or sewing. My first handmade doll was a fabric rag doll, in fact a forerunner to the doll in my first published book Embroidered Treasures. The Knitted Babe dolls soon followed when I asked my mum to re-teach me how to knit and from that I knitted a similar shape to the fabric doll to develop a basic knitted doll with a seam running all around the outside. Before all that however I concocted simple shiny space outfits from sweet wrappers, sellotape and foil for my Pippa dolls when I was about 9! Clothes for Knitted babes from Claire's Ravelry page. How did the idea for "Knitted Babes" came about? After that first doll, prototype if you like, was born/ created (looking slightly alien-like I must admit) I added hair and knitted a simple hat which I thought looked like a swimming hat - and then a swimming costume - then came her name: Dot Pebbles and then a notion that I could create a range of dolls and clothes and shoes - like the packets of little outfits and shoes I used to love to receive at Christmas for my Pippa dolls - and perhaps compile the whole lot into a catalogue or book which I eventually did. The title Knitted Babes came at the end - Bathing Belles was my first collective name. How has your toy-making career dove-tailed with parenting? As I mentioned it was because of my children that I first started to make dolls - I don't know why dolls and not other toys or bears, perhaps my childhood had some hand in that? -My daughter has the whole collection of all the dolls and the clothes that I have ever made (two suitcases full!) and the two boys have enjoyed the knitted bears I eventually got round to - but they don't make their own except my daughter who loves to dress peg dolls in her own eclectic style. One of Claire's newer styled Babes. Not that I feel I've exhausted the knitted doll which got bigger and easier to knit (if you like knitting in the round!) as the dolls progressed - and the doll eyes as opposed to the embroidered eyes I felt appealed more widely (- the embroidered eyes - although much more character giving - are a little tricky) but now I'm crocheting for the time being! And loving it! I'm in the process of adding a crochet doll to my collection… and also crochet letters with numbers to follow. Any advice for amateur doll-makers or inspirational thoughts? It's the faces that make the doll so don't just finish your doll off quickly. 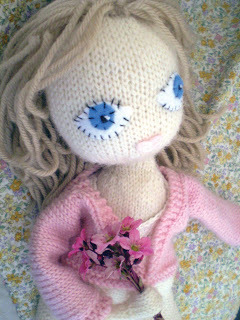 All, bar none, of my dolls have eyes and mouths removed many, many times before I am satisfied with the finished look! It's that expressive look you're after! and on Ravelry, where you will find all of her knitting patterns. And stay tuned for a giveaway of A Knitted Babes kit that will include the book and all of the supplies to make several knitted babes. Details in my next post. The Giveaway, details in my next post.